One of my favorite iced teas is the japanese cherry tea that they carry at The Coffee Bean and Tea Leaf here in LA. It has a very well-balanced combination of green tea and cherry flavors, and manages to taste slightly sweet even though there is no sugar in it. Most teas that have a cherry element either contain cherry flavoring or dried cherries, but I wanted to boost the cherry flavor a little more and play around until I had a iced tea that made cherries the star of the show. My Cherry Green Tea Iced Tea starts with freshly brewed green tea (not matcha, just any good quality green tea that you like) and I add fresh cherry juice to it. The result is a slightly pink tea with a great balance of green tea and cherry flavors. I added a little bit of sugar to mine to further highlight the sweetness of the cherries and serve it over ice. Not all fruit flavors work well with green tea, but cherry is definitely an exception. It has a rich sweetness to it that covers some of the grassy notes in the tea, making the tea milder and the drink as a whole even more refreshing. My cherry juice (use real juice or high quality juice from concentrate) provided a lot of sweetness, so I didn’t need to add too much sugar to my tea. Feel free to adjust the amount to your tastes. Store the tea in the refrigerator after you mix it up so you can serve it ice cold without having to water it down with too much ice! In a large pitcher, stir together green tea, cherry juice and sugar until sugar is dissolved. Taste and add additional sugar if necessary. Transfer the pitcher to the refrigerator and chill thoroughly. 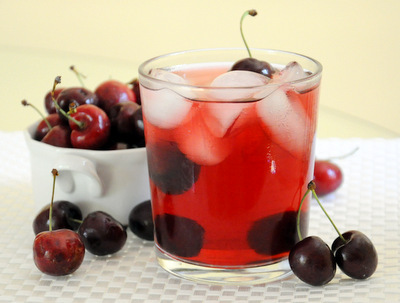 Pour over ice to serve and garnish with fresh cherries, if available.